I just recently turned 30. Needless to say that in the years preceding this, since I turned 25 at least, my 30th birthday was a day I was not looking forward to. 30 was scary. It seemed synonymous with "being an adult". No more fooling around, must be career-oriented, must have found your niche in life, must look put together and fabulous. In other words, you have had and enjoyed 30 years on this planet to fool around and experiment. By this time, you must already be quite though not entirely, a master of everyday living. No more time for temper tantrums, being late for appointments due to a bad hair day. At 30, you must have all figured out a shortcut to these daily dilemmas that seem petty but continue to plague us. Okay, so here's the thing. I've been 30 for 3 months now and it seems that nothing much has changed since I was 29. Duh! 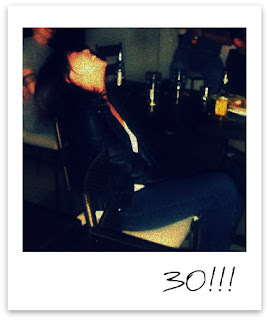 Well, ladies, turning 30 may seem scary but it really is just a number. I didn't start growing gray hair overnight. It is all a state of mind. I refuse to think old thus, therefore, i firmly believe, and this is my honest to goodness philosophy on this: "that acting and feeling young is the fountain of youth". I think it somehow stunts the aging process. People don't believe me when I say I'm 30. They say that I don't look it, which I love! I know that sooner or later age will definitely catch up with me but that's another issue. Right now, the only number I'm fearing is 50 (because of all those doctor appointments). Kinda excited to be called a Cougar....hahaha....if I don't turn into a cow before that. Which I'm hoping I don't. Although, I wouldn't mind being a cow if I was happy, well-fed and well-loved rather than a cougar that's always on the prowl. Over all, I think I'd like to start a sub-species called a "coucow ". I love getting to live "The Best Of Both Worlds", as Hannah Montana and my 3 year old daughter would say. Let's all be "Coucows" and start a new herd! Have a great day people!